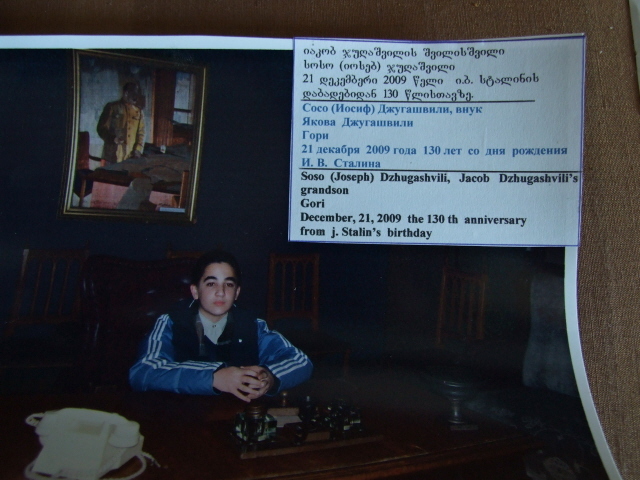 A museum in Stalin's birthplace of Gori, a town north-west of Georgia's capital Tbilisi. Here, Stalin had for decades been unabashedly celebrated as a great hero – no mention of purges, gulags or the like! But still, it has to be the most significant dark tourism destination in the whole of Georgia and an absolute must-see when in the country. 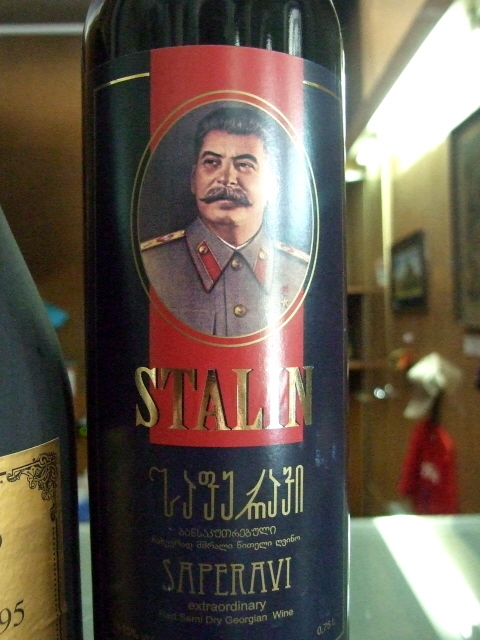 More background info: Josef Stalin – the name immediately triggers association with tyranny, at least in the West. And indeed Stalin was doubtless one of the greatest tyrants in world history. 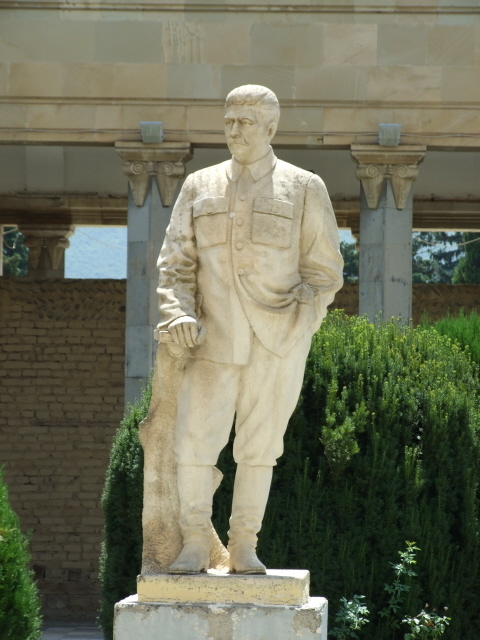 In Gori, his birthplace, however, he is still celebrated as an outstanding leader who brought the Soviet Union, and with it his home country Georgia, forward into the modern world, and who, in particular, was the man behind the great victory of WWII against Germany's Nazis. A similarly positive view is also regaining popularity in Russia these days, where the man is seen (by popular "vote" in opinion polls) as one of the greatest persons of the last century and Russia at large. True, his achievements in terms of the industrialization of the Soviet Union cannot easily be brushed aside ... although from today's perspective some of it was environmentally disastrous too. Nor is his military success in WWII in any doubt. From the point of view of the Soviet Empire, he was certainly also instrumental in strengthening it to become the world's second nuclear superpower and dominating leader of the Eastern Bloc during the Cold War. Some of the most enduring images of Stalin are those of him clearly being the strongman at the conferences in Yalta and in Potsdam, which shaped the post-war world so much (at least in Europe). On the other hand, there were the purges of the 1930s, the gulags, the famine … (see under Soviet Union, Russia, Kazakhstan, Stalin, Ukraine for more). Stalin was responsible for millions of deaths. Exactly how many millions is of course disputed, but he certainly ranks as one of the most murderous world leaders ever, if not even the top one. The cult of personality Stalin enjoyed was only dismantled from 1956, after his successor Nikita Khrushchev initiated the process of de-Stalinization. In Gori, however, none of this ever arrived for many decades. At the Stalin Museum time stood still in 1953, after the death of the great man. And no mention of anything that detracted from the glorification of Stalin. It was thus extraordinarily one-sided, lacking even the slightest attempt at being balanced in the portrayal of Stalin's life and legacy. 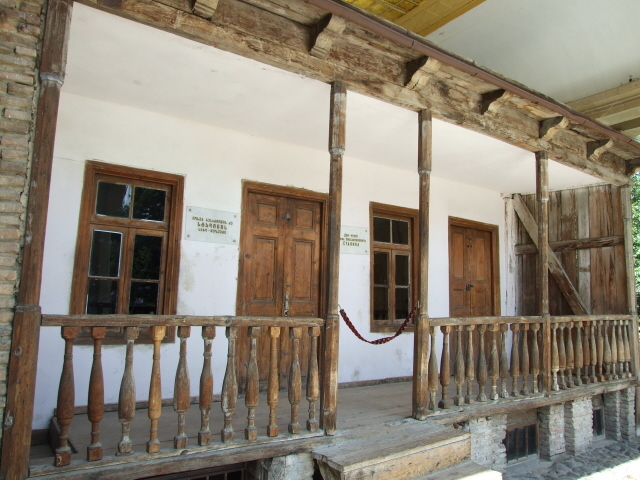 The museum also survived Georgia's efforts at de-Sovietization after independence, in particular when the pro-Western president Mikheil Saakashvili had been at the helm, and especially since the 2008 war with Russia over South Ossetia. 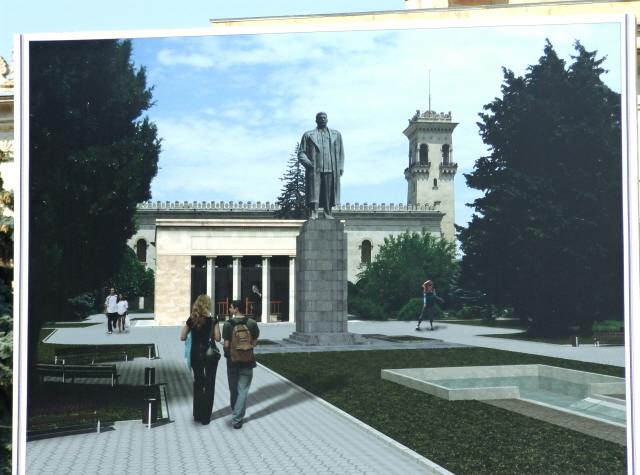 In a way, the museum even benefited from de-Sovietization in as much as the big Stalin statue which used to stand on the main square in Gori (and as such used to be a famous sight) was removed and added to the Stalin Museum's outdoor part. The unabashed one-sidedness of the museum is so gross that it makes it the main attraction of the place – at least for those who "enjoy" such OTT propaganda excesses. 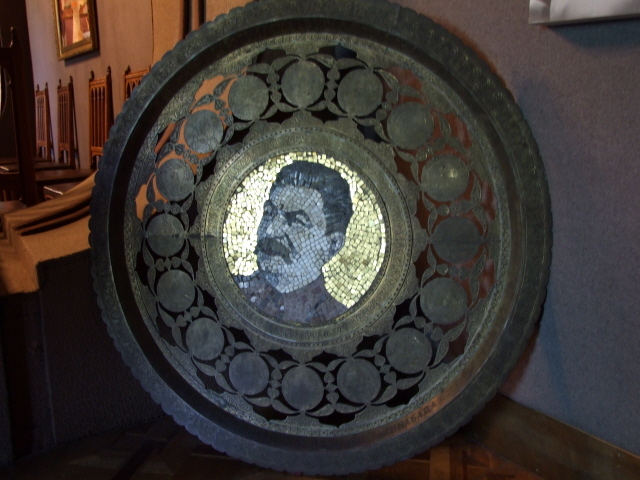 Apparently there were at some point plans to "rectify" the Stalin portrayal in this museum – i.e. make it more balanced, and at the same time, one can be sure, more anti-Russian … as that seems to be the current emphasis in Georgia in so many ways these days, ever since the 2008 war with the big old neighbour. Many will indeed have found it sickening how biased the portrayal of Stalin was here, and they'd be factually right to point it out of course. But then they missed the twisted "point" of visiting this place, which is precisely the extreme eccentricity displayed here. You do not visit this museum in order to see anything "objective", rather quite the opposite. And approached with that frame of mind, it's one of the most outstanding museum experiences to be had anywhere in the world (although North Korea can easily compete). I, for one, hope that this little relic of Stalin-cult-of-personality will continue to offer its trademark time-travelling experience. The suggestions of plans for an overhaul of the museum with the aim of putting Stalin more into proper historical context are a bit worrying in that respect, although it was also said that they were still preserving the pro-Stalin propaganda as museum pieces. I hope it manages to retain at least some of the bizarreness of this unique museum (which is not an easy thing to achieve – cf. e.g., Sachsenhausen). UPDATE 2017: the more ambitious plans for a redesign have meanwhile apparently been dropped, and only minor additions were introduced ... see below at the bottom of the next section! When you purchase your admission ticket you will first have to decide whether you want a guided tour or not. As the labelling in the museum is mostly in Georgian and Russian only, with only a few brief English labels added here and there, a tour may indeed be the better option for those not familiar with either language. The guides get good reviews, and are certainly experienced in taking foreigners around. I overheard a couple of guides and got the impression that the level of English was quite OK too. French and German are supposedly on offer as well. I still opted for a self-guided visit, though. It has the advantage that you can go through the museum at your own pace, and with your own emphases – or lack thereof. 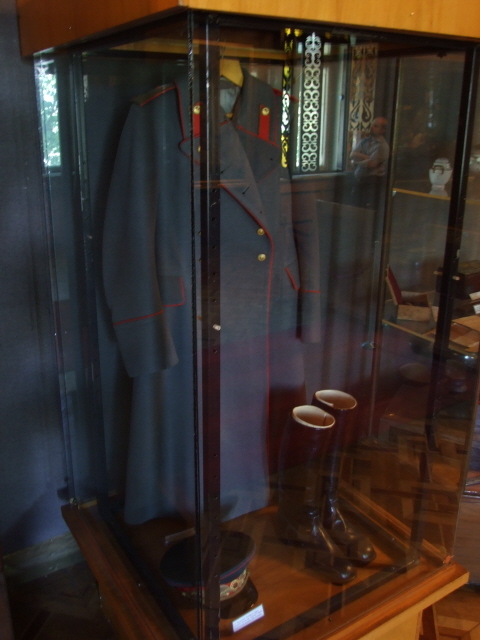 For instance, I saw the early-life parts of the museum (Stalin as a member of a priest seminary etc.) as rather less engaging and found myself speeding ahead of the two guided groups behind me – which in turn later overtook me again in sections where I lingered longer than the guided tour seemed to allow for. Naturally, it only really makes sense to opt for self-guided if you have at least a working knowledge of Russian, or are with someone who does and can translate for you (my wife, who is a Russianist, is always a great asset in places like this, as my own knowledge of Russian is way too minimal to get by by myself – thanks Sally!). 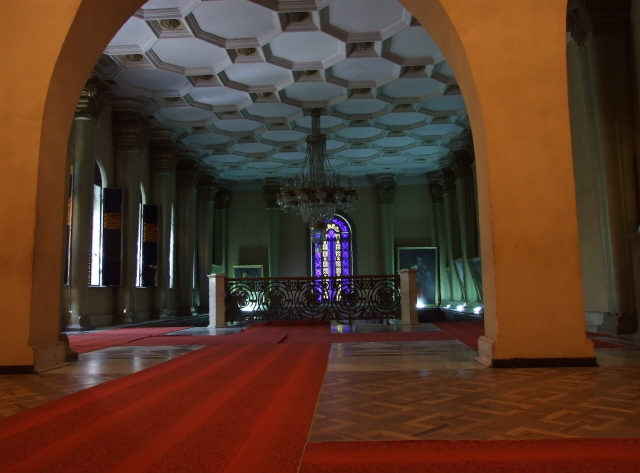 The scene is set as you climb the grand carpeted marble staircase to get to the exhibition part of the museum, past a marble Stalin statue and a row of Stalin paintings set in between church-like stained-glass windows. 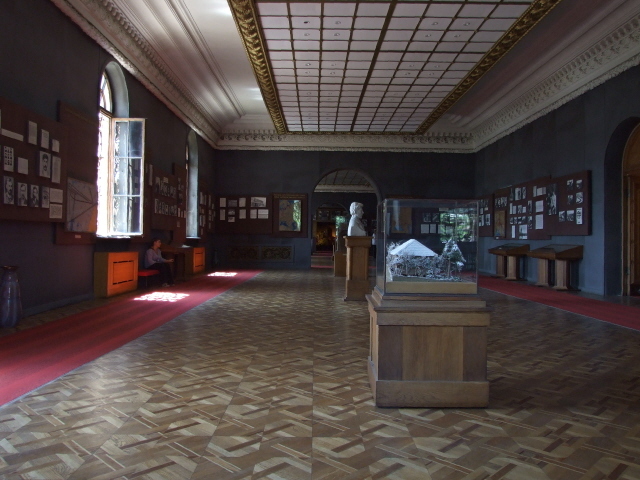 Upstairs you enter the first hall – a sombre room with creaky parquet floors and a few display cabinets and busts in the middle. Most of the material is set out along the walls, though. This first section covers Stalin's early life – though there's very little on his childhood, and pre-communist life in general. The Stalin the museum is eager to portray really only came into existence with him turning into a Marxist-Leninist revolutionary. His rise to power within the nascent Soviet Union is basically painted out to be one of great accomplishments and there are numerous documents and photos to underline this. A whole glass-display case load of books penned by Stalin and translated into various languages bang on about the same message. 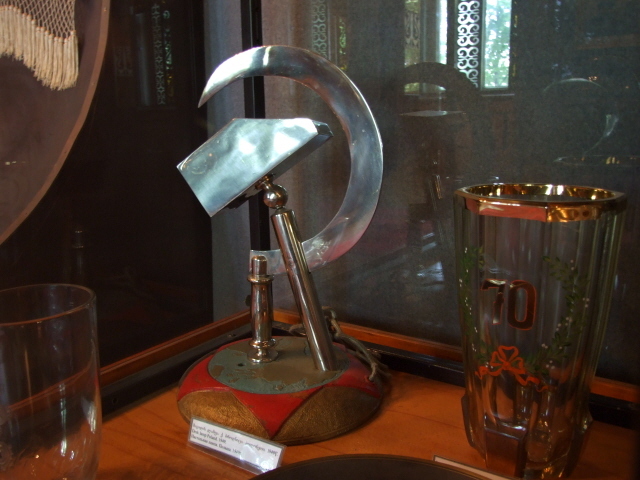 One item, though, made me raise my eyebrows: I had not expected to see any mention of Leo Trotsky here – the co-revolutionary who fell out with Stalin, opposed his accumulation of power and therefore was expelled from the party and later assassinated on Stalin's orders (in 1940 while in exile in Mexico). In addition, Trotsky was also removed from photographic images showing him together with his friend Lenin. His "disappearance" from such photos through editing, i.e. falsification, stands amongst the most classic examples of after-the-event censorship and manipulation of history in the Soviet Union. 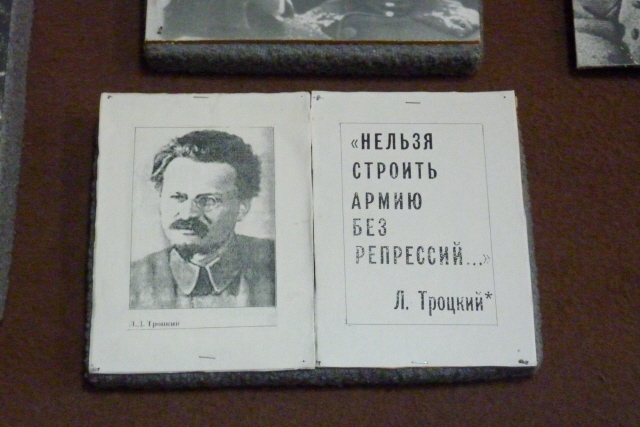 All the more surprising, then, to find an image of Trotsky here at Gori's Stalin Museum. The quote from Trotsky's autobiography, however, has a certain ironic ring to it here – in English it says "An army cannot be built without reprisals". He certainly experienced reprisals himself – though he wasn't quite "sent to the ash heap of history" (another famous Trotsky quotation). 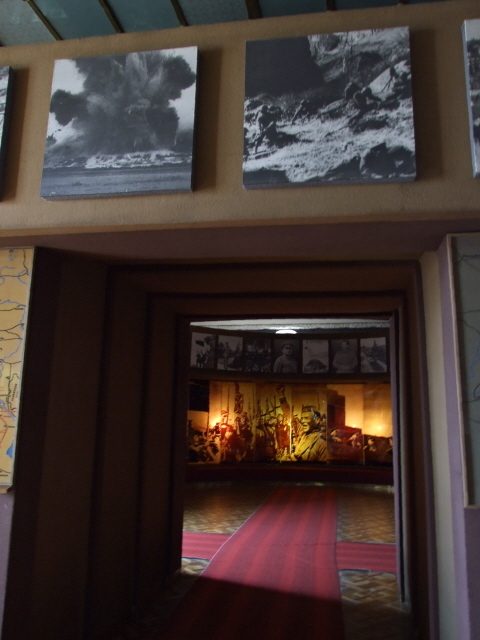 The museum's second hall is approached through a doorway that already brings up the subject of war. 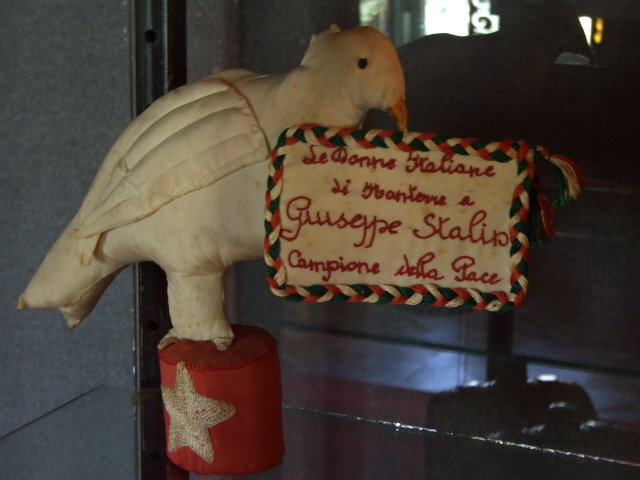 Predictably, the victory in WWII is a major focus of the Stalin Museum, and various exhibits and large photos sing the praises of the Red Army and its grand commander. So far so predictable. 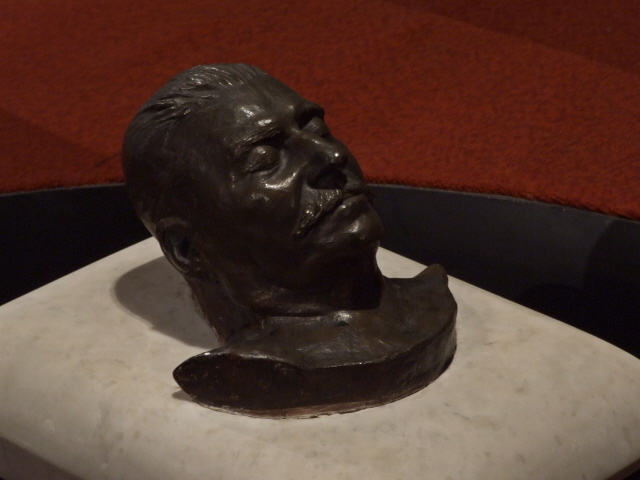 But the next room is really something special and a highlight of the museum: It's a temple-like shrine with Stalin's death mask at its centre. 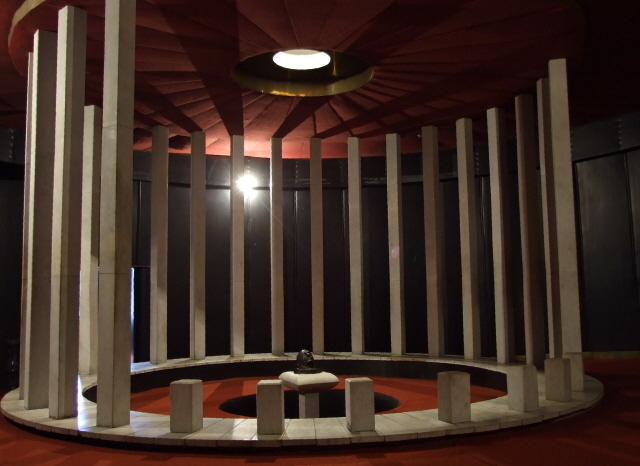 The bust-like black death mask rests on a cushion supported on a column which is set into a hole in the ground in the centre of a circular red-carpeted area surrounded by a ring of pillars rising to the equally red ceiling. It's so over the top it's breathtaking. 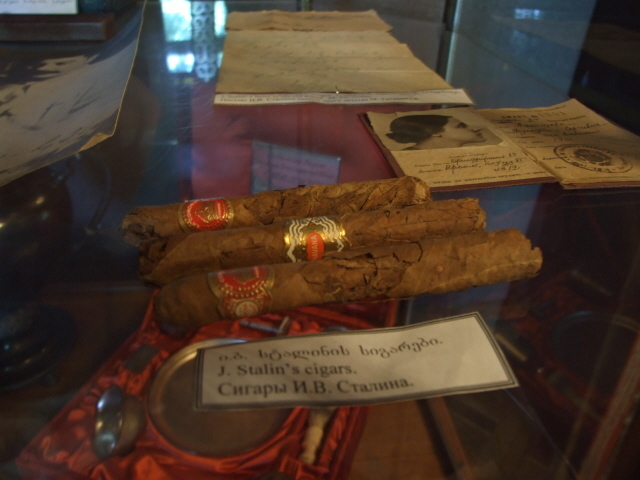 This is followed by collections of personal belongings of Stalin, including some of his office furniture, cigars and the famous grey coat and black leather boots that he was so often portrayed in on paintings and photos. There was at some point also talk of plans for an added museum exhibition about the recent alleged "Russian aggression" ... while South Ossetia allegedly opened a war museum of its own, in which it accuses Georgia of war crimes … you can see the issues are far from resolved … When I was in Gori in August 2010 I asked one of the managing staff (who spoke English) about this, and she claimed that there had indeed been such plans but that they were dropped. However, there is a small section about the 2008 war in the nearby war museum. Outside the main Stalin Museum building, there's still more to see. 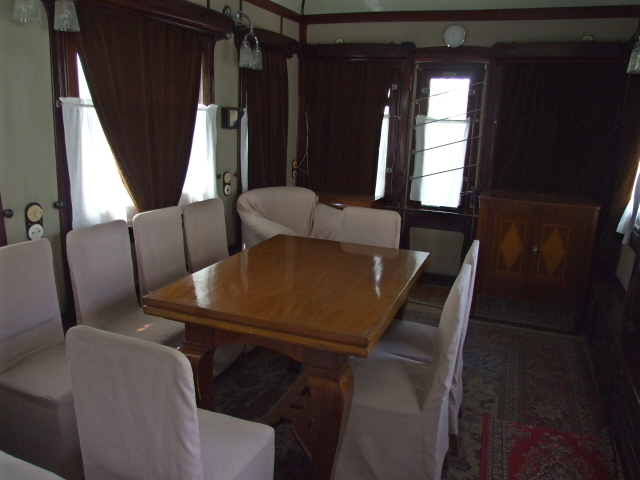 In particular, there's the armoured rail carriage used by Stalin to get to the Yalta, Teheran and Potsdam conferences. Stalin preferred to travel by train because he was scared of flying (a bit like his ideological offspring Kim Jong Il). You need a separate ticket to take a look inside – a guide will unlock the door and you can wander up and down the carriage's corridor and peek into its various compartments and see e.g. Stalin's bed and bathroom as well as the train carriage's own conference room at the back. 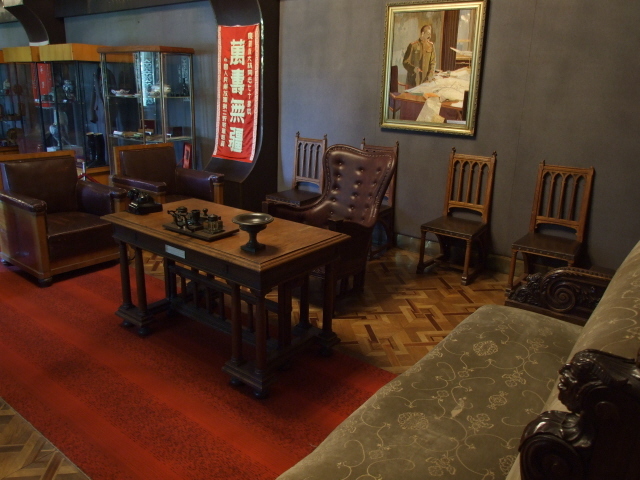 Also outside is the museum's most original and biggest star exhibit: the great man's birth house. With the guide you can look into the sparsely furnished rooms where young Iosef Dzhugashvili spent his earliest years before becoming Stalin. 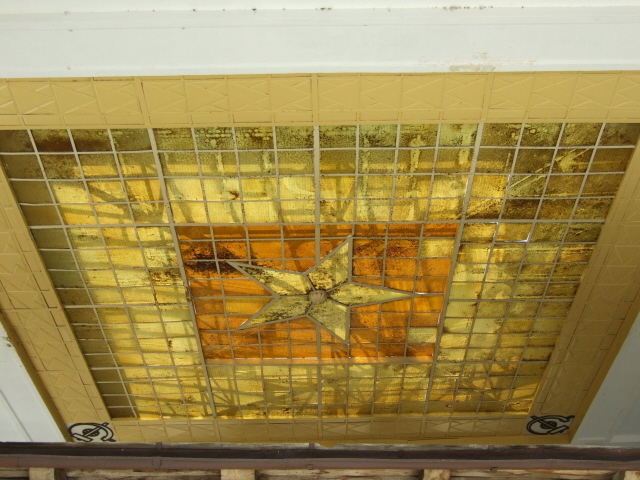 The simple brick-and-mud building is protected from the elements by a superstructure that turns the whole thing into an oversized shrine – complete with a giant Soviet star set in the ceiling above the birth house, a kind of Soviet equivalent of the star of Bethlehem perhaps? 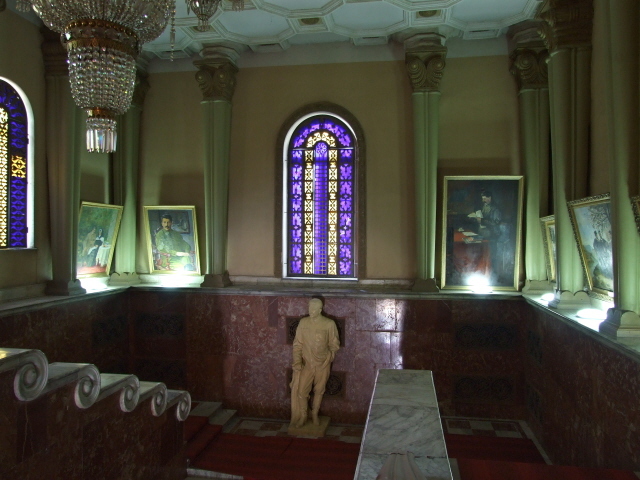 Between the birth house and the museum proper stands a marble statue of Stalin rather forlornly – and looks exactly like the statue in the grand staircase inside. 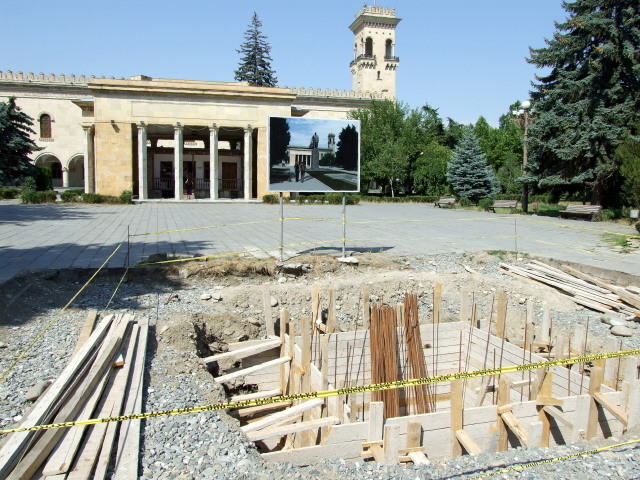 A much grander statue was to join the ensemble soon: when I visited the place in August 2010 construction work was going on in the park in front of the Stalin birth house: this is the place where the 20-foot bronze Stalin statue that used to stand on the main square in front of the city hall of Gori was going to be re-erected. A montaged photo poster gave an artist's impression of what it was intended to look when it's finished. By now it probably is. But I haven't yet seen any real photos of it at this new location. UPDATE 2012: the above is a description of the state I found the museum in in 2010 – if the announced overhaul of the museum has meanwhile indeed taken place, then it may be outdated. There will probably be more mention of Stalin's evil historical impact, and perhaps the section on the 2008 war with Russia may finally have materialized. If anyone has seen this museum recently and can give me information about this, I'd be grateful for any such info (please contact me). Location: about a third of a mile (600 m) north of Stalin Square in the centre of Gori, at the northern end of Stain Avenue, at No. 32. Access and costs: easy to find, a bit on the expensive side for a museum in Georgia. Details: once you've made it to Gori, you will most likely either walk from the train station or the bus or marshrutka drop-off point. From the train station it's a good mile to walk in total (or get a taxi): first cross the bridge over the river, and then walk the entire length of Stalin Avenue (marked as such in English even), past the expanse of central Stalin Square and through the park that leads up to the museum. The building is impossible to miss: a big, imposing, mock-Venetian-palace style edifice with a tall campanile to the right. 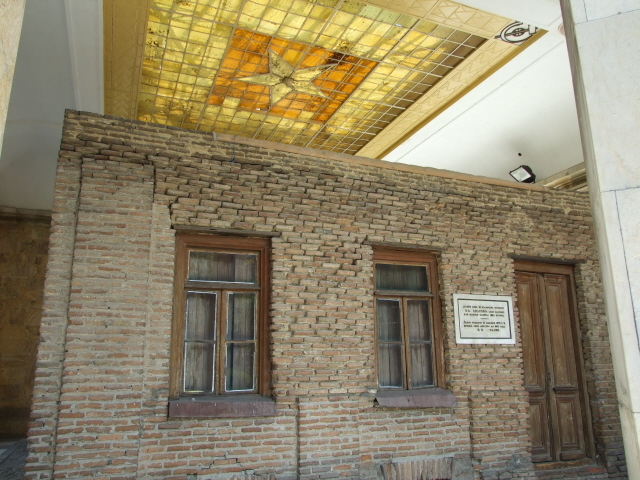 The Stalin birth house shrine (and the relocated bronze Stalin statue – see Gori) are in front of the museum, the main entrance is in the east wing of the building under the colonnades. If arriving by bus or marshrutka try to be dropped off before the terminus, closer to Stalin Square, or from the bus station first walk east along Chavchavadse to the corner of Stalin Square, turn left and walk to the northern end of Stalin Avenue, in total it's about three quarters of a mile (1 ¼ km). 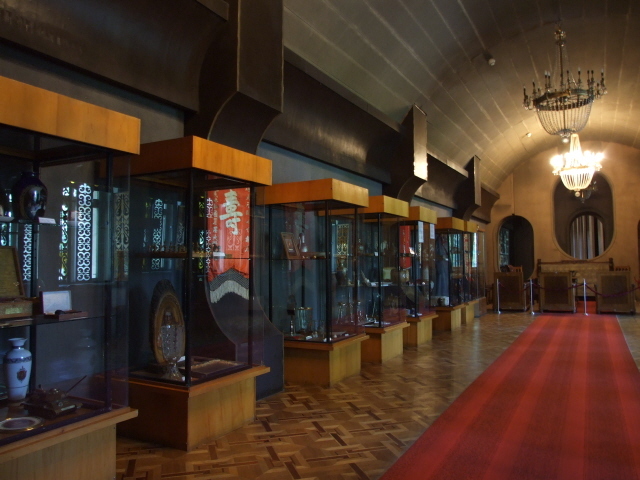 The museum's main exhibition halls are upstairs. Only the ticket both and the museum shop are downstairs. The rest of the downstairs floor appears to contain only lots of administrative offices along dark corridors with a surprisingly large number of people lounging about not doing very much in particular … UPDATE: and now there are said to be two additional exhibition rooms downstairs too (see above). Admission: 10 GEL for the museum, and an extra 5 GEL for Stalin's rail carriage. 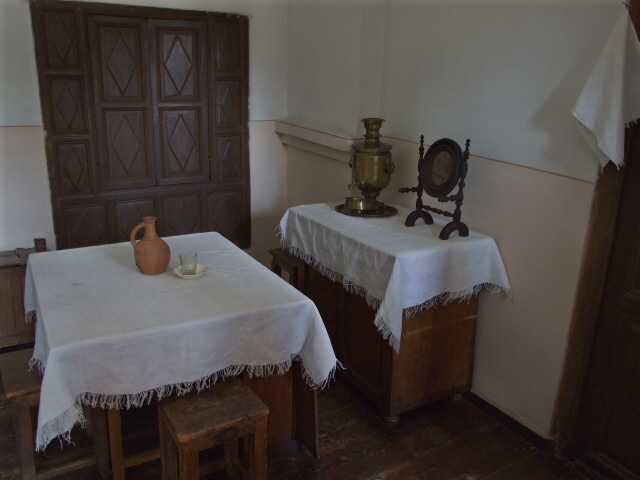 The birth house is free to view from the outside but to look in you need to be with the guide who will also open the rail carriage for you. A guided tour of the main exhibition costs 15 GEL. Some concessions apply. Combinations with other dark destinations: On the way down Stalin Avenue towards Stalin Square is the small Gori war museum (on the western side of the street), which is a good addition, as it not only commemorates the Great Patriotic War but also contains yet another Stalin statue, and also has a section about the short summer 2008 war with Russia when Gori came under air attack and was briefly occupied by Russian troops. Otherwise see under Gori, Tbilisi and Georgia in general. Combinations with non-dark destinations: see Gori.